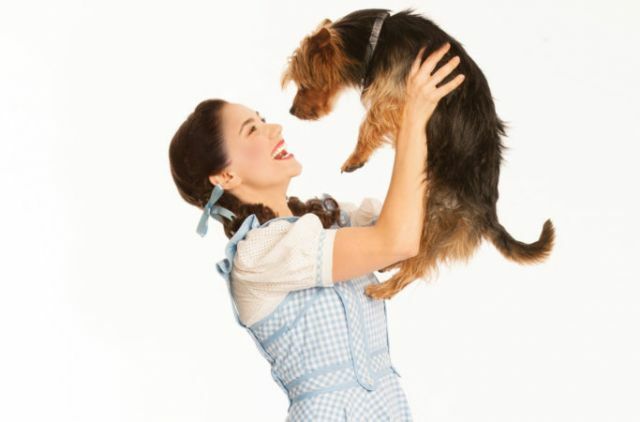 In The Wizard of Oz, Dorothy’s resilience is tested when a tornado strands her far away with her faithful dog Toto at her side. In an unlikely but true story, SA Correspondent Lesley Reed relates how her own father’s experience of being stranded far from home during World War II helped pioneer dog training in Australia, with a special connection to the current national tour. It’s difficult to imagine what it would be like to find oneself suddenly alone and separated from family in a strange place that’s completely unlike anything you’ve experienced before. It’s what resilient young girl Dorothy must confront in the story of The Wizard of Oz. Mystery and unexpected events pervade every bend in the road as Dorothy experiences both danger and magical times. All the while, her little terrier Toto remains at her side, sustaining her with his loyalty. 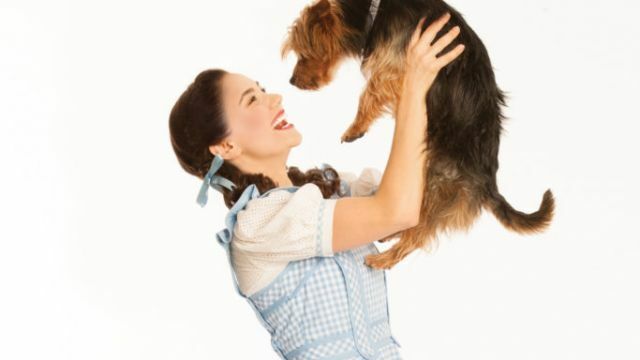 In the current touring Andrew Lloyd Webber Palladium production of The Wizard of Oz, the role of Toto the terrier is shared by two dogs, outgoing male Trouble and quieter female Flick. Each is trained by Luke Hura, Australia’s most prolific trainer of dogs and other animals for film, television and stage. Testament to Luke’s experience, reviews to date enthuse about the unexpectedly extensive talents Toto displays. “When I first began training dogs I would spend up to twelve months training, teaching them anything up to one hundred commands, and then create the magic on the set,” Luke said. “Over the years I changed this to training and creating the character at the same time, but this can be much slower. Luke added that working on The Wizard of Oz had been an education for him. Themes of courage, initiative and believing in oneself are at the core of The Wizard of Oz and there are several similar real-life threads in the story behind Luke’s entry into the entertainment industry. The tale behind the trainer of ‘Toto’ began over seventy years ago with my late father Mason Clark, who, like Dorothy, was stranded in a faraway place. Captured by the German army during the World War II Siege of Tobruk, then incarcerated in a prison camp in northern Italy, there was no likely end to his predicament. He, along with the many imprisoned with him, needed resilience and courage to bear the harsh conditions. While in the camp, and despite torturous times, my father spent time observing the guards using German Shepherd dogs in their daily duties. It sparked in him an interest in dog training that would bear fruit later. Unlike Dorothy, my father didn’t have a pair of ruby shoes to magically transport him home. He and others had tried once to escape, having built a tunnel under the camp to the outside. At that time they were quickly recaptured. Some time later, Dad was outside the camp in a work party when he and five or six others took their opportunity to run. Helped by a brave sixteen-year-old Italian boy as guide and wearing only a pair of prison shorts, my father trekked his own eventful Yellow Brick Road over the Alps dividing Italy and Switzerland. He was repatriated to Australia near war’s end. Back in Australia, Dad set up the first Australian tracking dog unit for the Commonwealth Police, which became widely known for its skilled animals. In the mid 1970’s and retired, he joined a dog tracking club and there he met a young Luke Hura, who, while having an awarded background in dog trials and obedience, was now interested in tracker dogs. In the early 1980’s my father visited an Adelaide casting agency to enquire about advising on animal training for the entertainment industry. While there, Dad mentioned he had a friend who trained dogs and who wanted to work in the industry. “That very same week, Mason received a call from the agency asking if his friend had a little terrier,” Luke said. “Although he knew I didn’t have any terriers, he replied that I did. He called me and told me to quickly find one for a TV commercial. I searched the local newspaper and found a breeder of Australian Terriers. I bought one called Higgins. “I ended up doing quite a number of TV commercials for a Building Society. This was the start of my journey into this incredible industry, but it was the only time I have used an Aussie Terrier until now, for The Wizard of Oz,” Luke said. Since that very first TV ad in 1981 Luke has trained dogs and various animals for over three thousand commercials and hundreds of TV series, telemovies, miniseries and feature films, as well as a number of musicals. Bouncer, the Labrador in Neighbours during the late 1980’s and early 1990s was one of Luke’s successes. He also trained all the lead dogs in two of the most successful and top-grossing dog movies ever made in Australia, Red Dog and Oddball. Simple really, or so it may seem, but I’m sure my father would have spoken about discipline too. Despite the conditions, he kept up the discipline of being physically fit in the prison camp, as he had done at home before the war, in order to stay well. This continued in his post-war dog training. Luke uses the same discipline, founded on inducing trust and focus in the animal, plus a process of conditioning. “Although my training is food based,” he said, “it is just as important to have a positive and clear mind. As part of their survival skill, dogs learn how to read us like a book. Every action and every word and thought creates a different body language in us, and this is what the dog learns from and reacts to. Body language and voice tones are vital. Luke believes every dog is capable of learning something, but this depends on the trainer and the desire the dog has to work with them. “I can definitely say not every dog would be suitable for this kind of work,” he said. The successful actors in Andrew Lloyd Webber’s sumptuous London Palladium production of The Wizard of Oz have honed their skills over many years. The tiniest ‘actors’ of all amongst the celebrated company of Anthony Warlow, Lucy Durack, Jemma Rix, Samantha Dodemaide and others can hold their heads high within the cast. Australia’s Totos have their own creative history to tell; a long and shaggy tale that began far away from Oz. Images: Luke Hura and Samantha Dodemaide with 'Toto' - Photographer: Brian Geach. Images of Mason Clark courtesy of Lesley Reed.